This is the first paperback Portuguese edition of the fourth Tony Hillerman Navajo Mystery, People of Darkness. 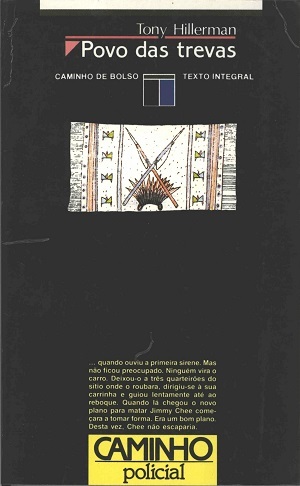 This edition published in 1991 by Caminho de Bolso in Lisbon, Portugal. Tony Hillerman's original text was translated from English to Portuguese by Maria Jose Bellino Machado. The cover was designed by Henrique Cayette. The cover features two lances which are crossed over a Plains Indian-like feathered headdress on a fringed Navajo blanket. Format: Paperback, 19.2 x 11.8 cm. Binding: Full-colored paper covers with the publisher's logo, book number, author, title are printed vertically on the spine.